A floundering medical complex sits on a 20-acre campus in Stapleton on the North Shore of Staten Island. Today, eight of Bayley Seton Hospital’s twelve buildings lie abandoned, the largest being the old Nurses’ Residence at its southeast corner. The grounds of BSH house Staten Island’s first hospital, an historic colonnaded structure built in the 1830s to serve ailing retired naval and merchant sailors, appropriately named “the Seamen’s Retreat.” Change came to the site in 1858 when a mob of 30-40 prominent locals attacked and burned down the Port of New York Quarantine Hospital, located a mile north of the Retreat. Though this horrific incident was incensed by an outbreak of yellow fever the locals blamed on the nearby hospital, flagrant racism was most likely a factor—recent immigrants made up the majority of the hospital’s population. Some of the quarantine station’s services were transferred to areas of what is now Bayley Seton Hospital, and placed under the jurisdiction of the Marine Hospital Service, which by 1885 controlled the entire complex, and by 1902 had been renamed the US Public Health Service. In the 1930s, President Roosevelt started a campaign to revitalize The Public Health Service Hospitals, resulting in the construction of the main seven-story art-deco building and its offshoot Nurses’ Residence, a winged four-story structure on the southeast corner of the property. 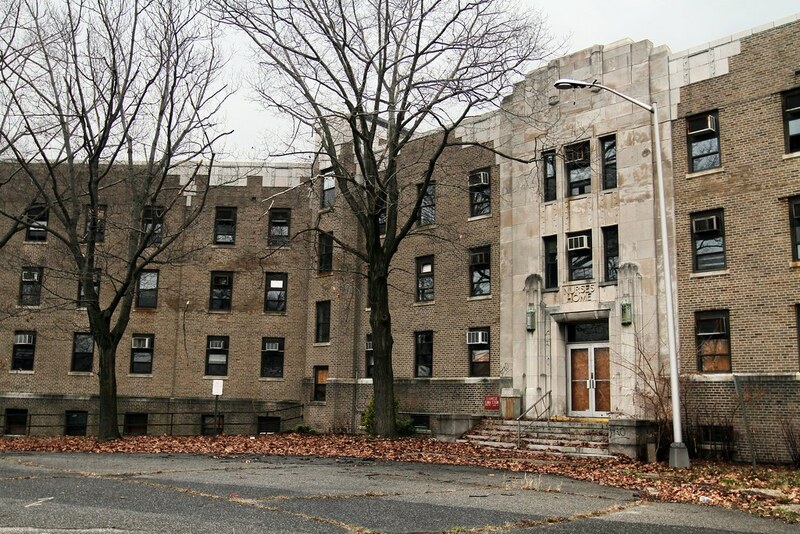 The hospital was sold to the Sisters of Charity of New York, a Catholic healthcare organization, in 1980. At this point the U.S. Health Service Hospital was renamed after Sisters’ founder Elizabeth Seton and her father Richard Bayley (who coincidentally once headed the ill-fated Thompkinsville Quarantine Hospital.) 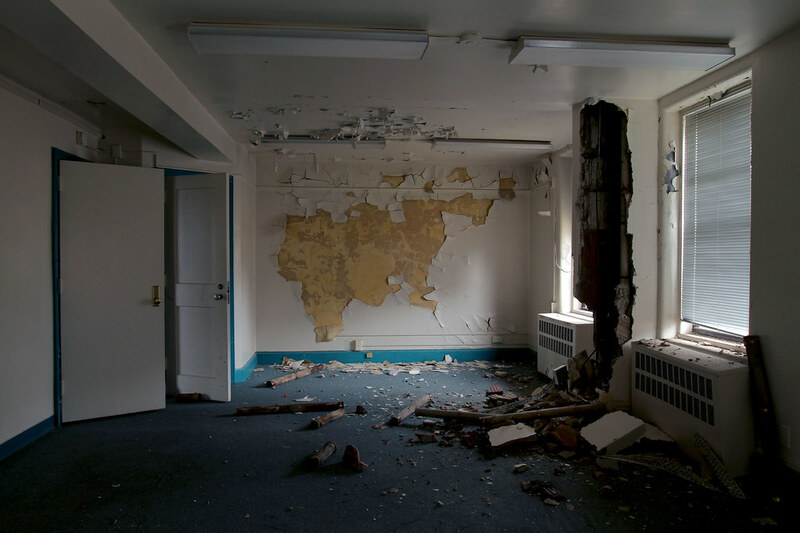 Under the Sisters of Charity, the hospital was predominantly used to treat mental disorders and substance abuse, and continues to fulfill this role today, albeit at a greatly diminished capacity. In 2000, The Sisters of Charity turned over Bayley Seton to the related Saint Vincent’s Catholic Medical Center, which faced financial troubles at the Stapleton campus from the beginning. Over half of its services were suspended and the hospital fell into an inexorable decline. Plans to close Bayley Seton emerged in 2004 as Saint Vincent’s, once the largest Catholic Health organization in New York, filed for bankruptcy with a debt of over a billion dollars. 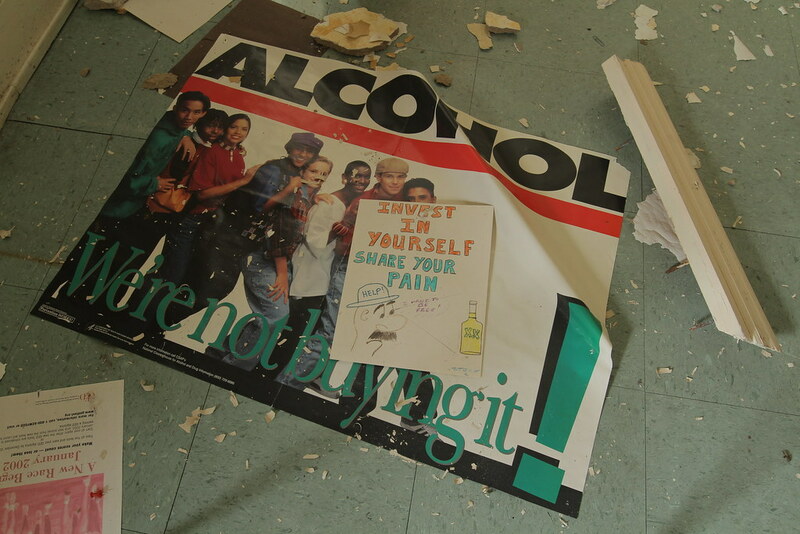 At some point during this tumultuous period (artifacts point to the building last being inhabited in 2002,) the former Nurses’ Residence, which had most recently been used as a New York addiction treatment facility, was abandoned as part of an ongoing series of downsizings and closures. One of many gutted rooms, beginning to show signs of age. In 2009, The Salvation Army settled on a 7.6 million dollar deal to purchase 7 acres of BSH. Originally, plans called for the construction of a 120,000 square-foot community center in the footstep of the Nurses’ Residence, set to begin in 2011, followed by a two-year period to terminate Bayley Seton’s remaining services, after which the main building would also be converted into senior housing. If it’s ever built, the center will be one of 30 similar complexes across the country funded by a 1.5 billion dollar endowment by the late Joan Kroc, widow of McDonald’s founder Ray Kroc. The Salvation Army failed to raise the 25 million needed to cover the difference between its cut of the Kroc endowment and the projected cost of construction, and ground has yet to be broken. The Kroc Center in a 2007 rendering. Twelve foot chain link fences have been placed along the perimeter of the Salvation Army property, but the site is otherwise untouched. Fenced-off and boarded-up, the Nurses’ Home ages in secret. Walls molt through layers of colored paint under tumbledown ceilings. 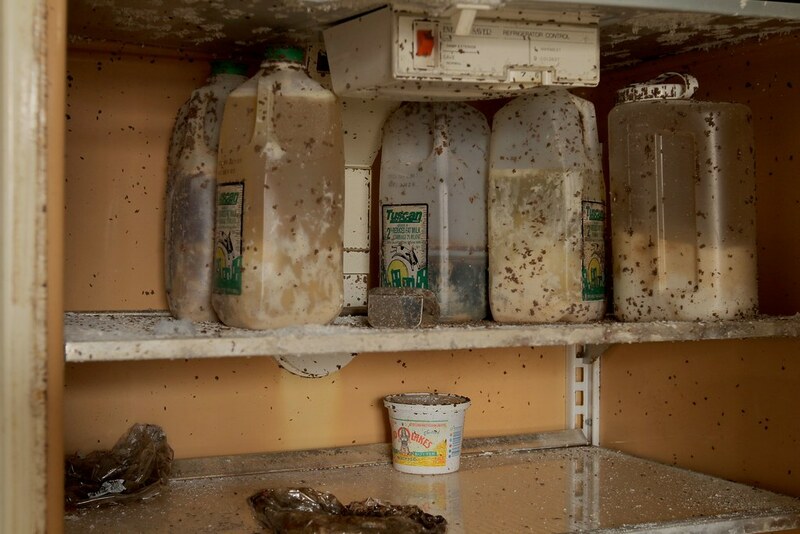 The unrecognizable contents of a half-dozen milk cartons fester in a neglected refrigerator. An upright piano keeps mum in an empty common room while activity slows to a trickle on the rest of the Bayley Seton Hospital campus. Here and there, artifacts remain—painted crafts, motivational posters, hand-drawn cartoons—evoking the human element of the hospital’s better days. 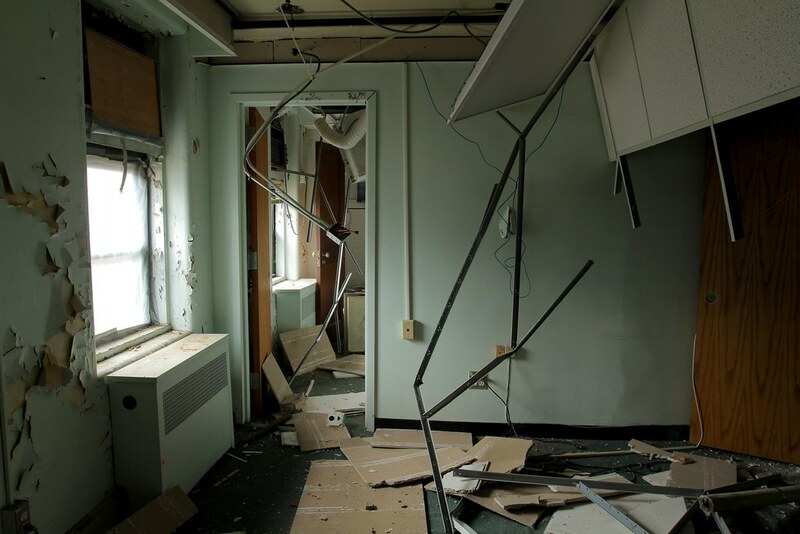 With its subtle architectural charms, the Nurses’ Residence has little hope of being saved from the wrecking ball, (though a few conservationists are out to change that.) Those in power seem to agree—despite centuries of convoluted history, it’s time to pull the plug on Bayley Seton Hospital. 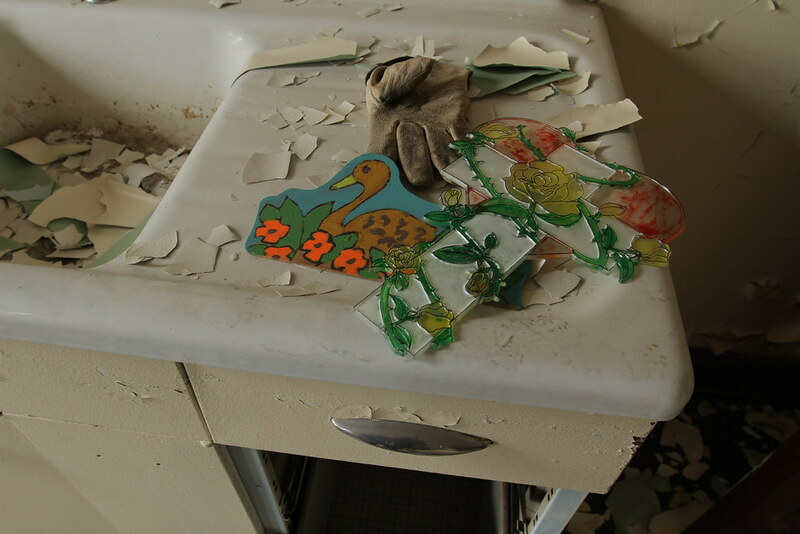 For more photos of Bayley Seton Hospital’s abandonments, go on to PART II. 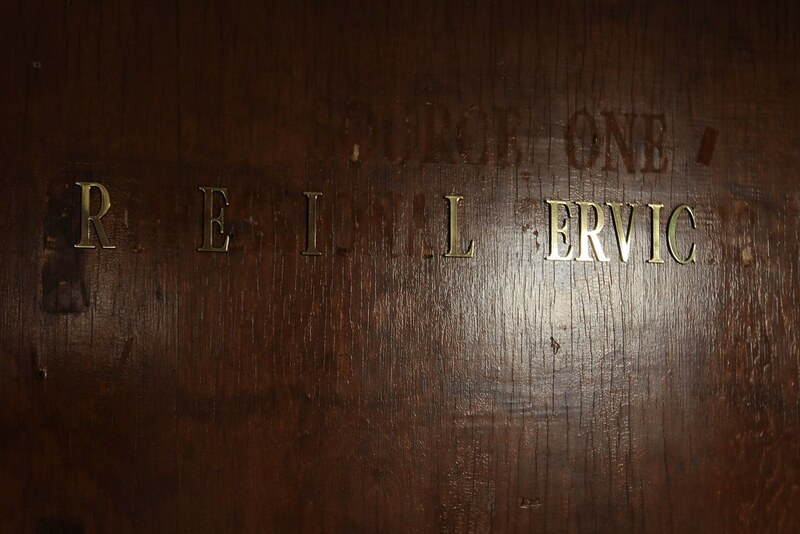 Lettering here once pointed out the “Professional Services” office. 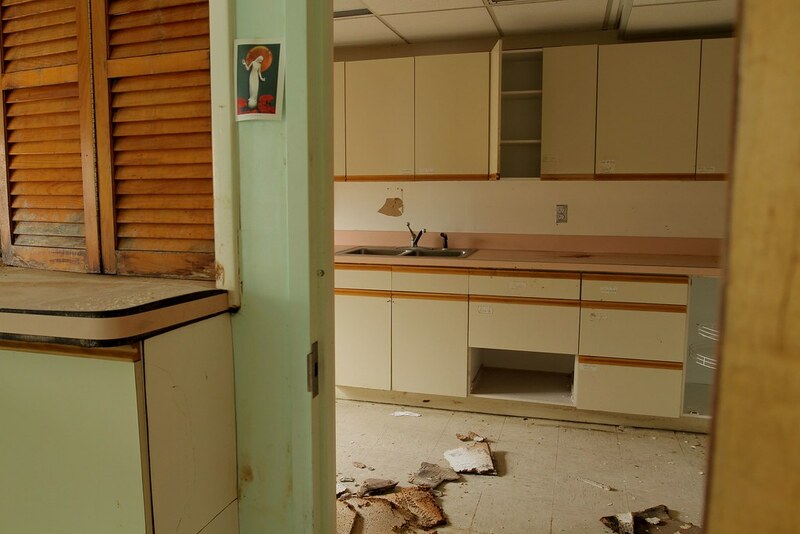 A kitchen on the top floor in the early stages of decay. The contents of a staff-only refrigerator left long after their expiration dates. This piano wasn’t worth the difficulty in transporting it. Cheap ceilings crumble in the reception area. 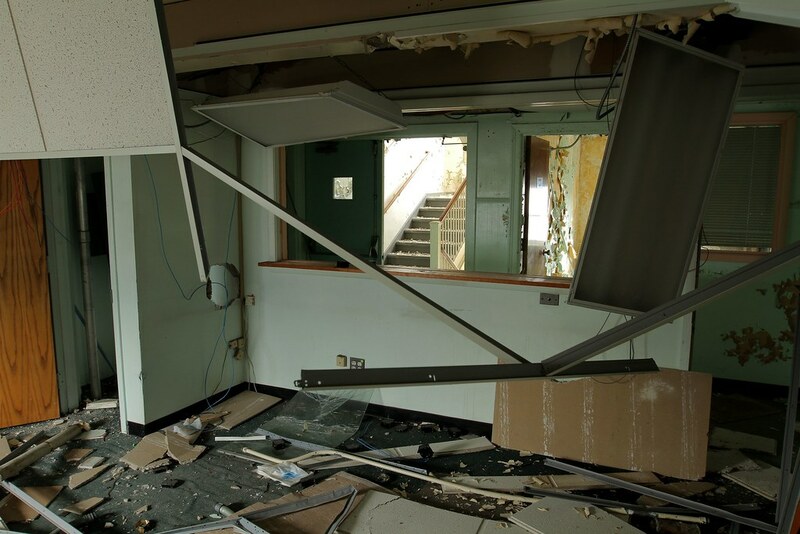 Fluorescent fixtures dangle by the reception window. Mold spreads on the walls of a first floor residence. 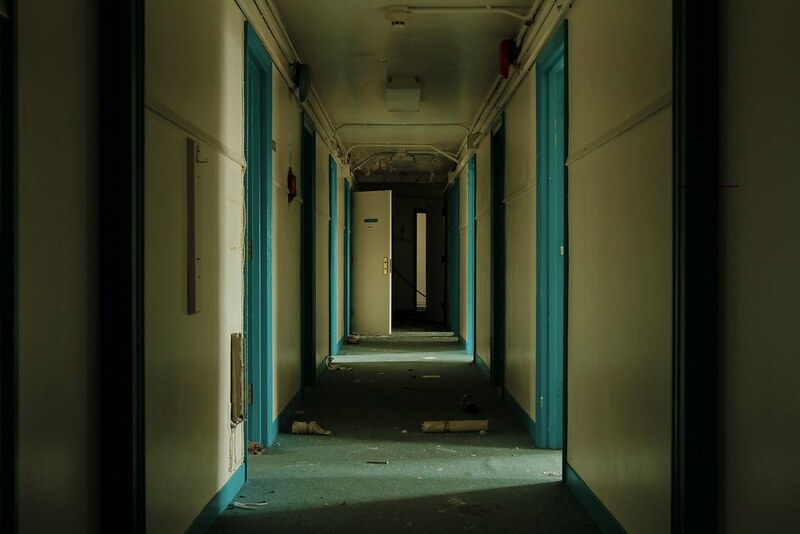 Another creepy hallway of the former Nurses’ Home. An exterior view of the abandoned Nurses’ Home as it stands today. I’m surprised that the bottles in the fridge hadn’t blown up over the years. rode my bike past here countless times while I grew up living in one of the officers’ quarters. My Dad was a doc. there when it was the USPHS Hosp. SO sad to see. When I was a girl, I used to climb the aluminum light poles like the one seen in this picture. Scared my Mom to death. LOL. It’so sad to see the property deteriorate like this,it was a fine hospital in it’s heyday. I loved living there as a child. I was back tnrough this summer and have many more pics. I swear looks like exterior structures are sound and looks like this could be renovated. Imagine the hospital as an amazing Children’s hospital with those officer’s quarters restored as family housing like several smaller Ronald McDonalds! It COULD be GREAT again! 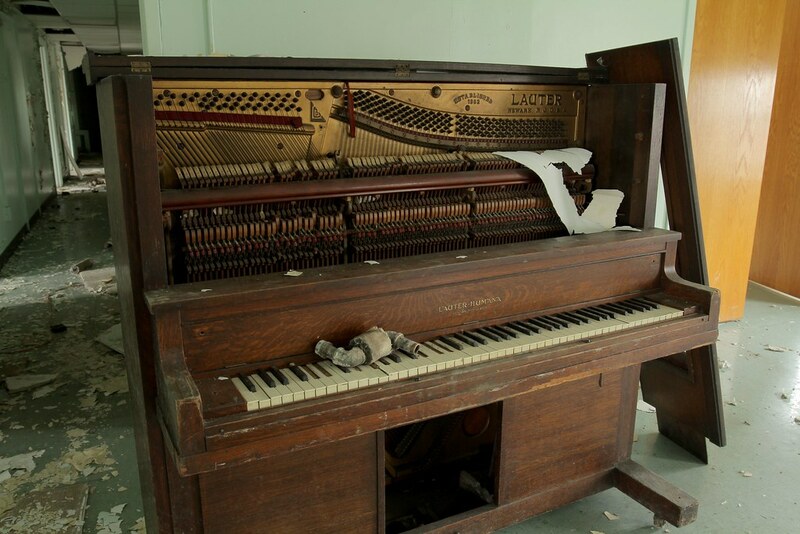 That ugly old upright piano reminds me of the one that was left behind in an old house that I purchased a few years ago. I couldn’t even give the piano away even though it still made noise! The demand is next to nothing for pianos anymore. I ended up breaking out my axe and sledgehammer and busting up the old piano. The wood scraps made for a pretty nice fire in sub zero temperatures! 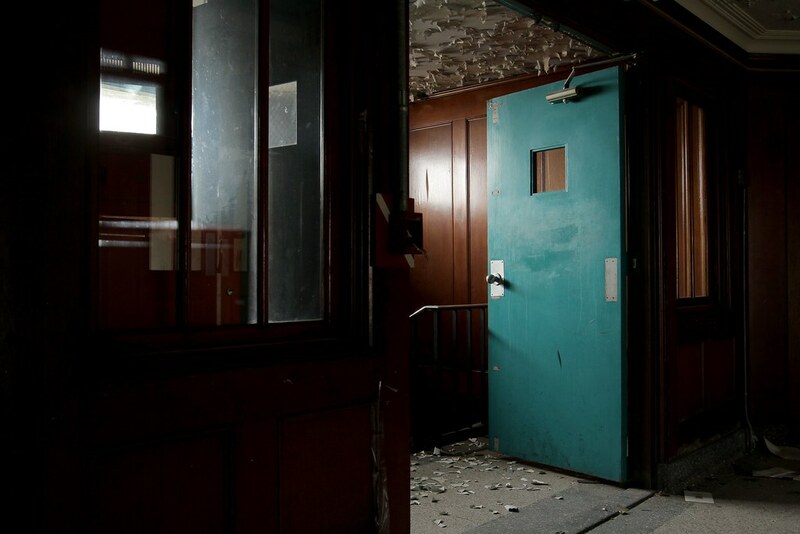 Pingback: 10 of NYC’s Abandoned Hospitals: North Brother Island, Staten Island Farm Colony, Creedmoor | Untapped Cities - 2-17-15. 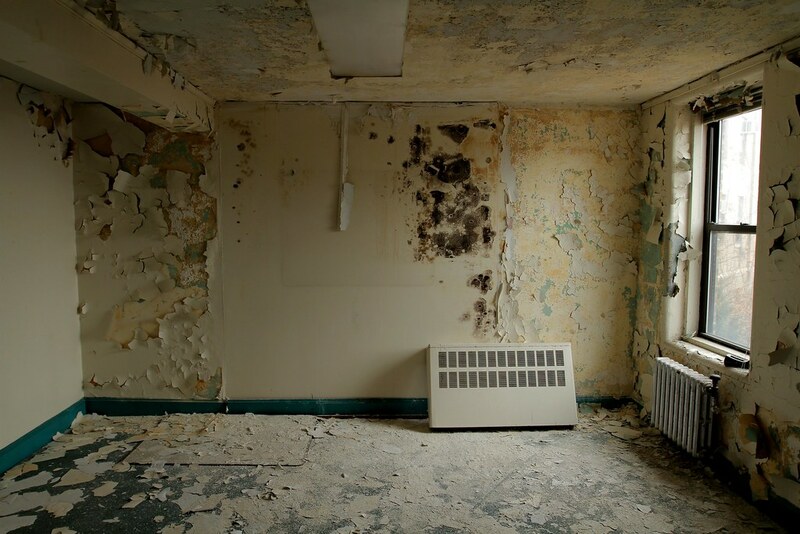 Pingback: Drone Video Captures Abandoned Bayley Seton Hospital on Staten Island from Above | Untapped Cities - 8-16-18.